Very good. Nice pint of Banks's Bitter, pretty cheap. Worth seeking out. 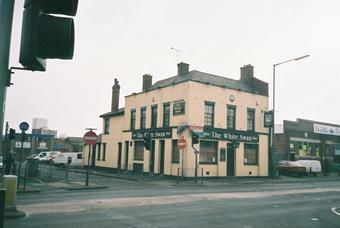 Ignore that, I was on about the White Swan in Bradford Street. Very old-fashioned palace of a boozer, all brass, dark wood and ornate green tiling, this is a Banks' pub just down the road from the Anchor, set between a couple of disused warehouses on a Digbeth side-street. The landlady is friendly, the beer extremely well-kept (including some from Jennings') and fairly cheap, making this one to seek out when in central Brum.